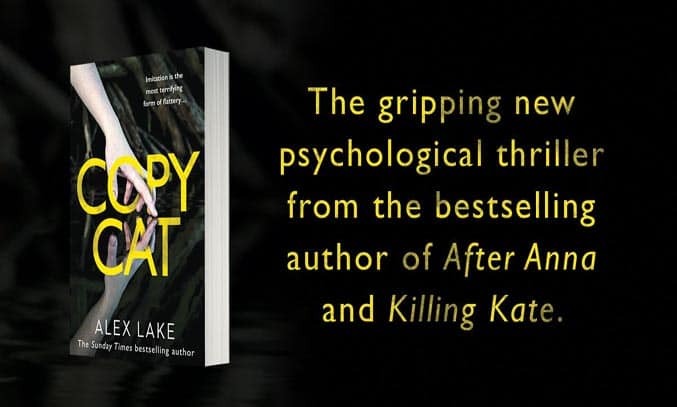 Following the top-ten Sunday Times bestseller AFTER ANNA, pseudonym Alex Lake makes a welcome return to the bookshelves with a gripping new psychological thriller COPYCAT. COPYCAT follows Sarah Havenant, mother of three and loving wife to Ben, whose happy life takes a chilling turn when she discovers two Facebook profiles in her name. One profile she recognises as her own but the other she has never seen before, yet everything in it is accurate, even photos of her new kitchen taken from inside her house. Who has set it up and why? Soon, the creepy annoyance quickly turns into something far more sinister as the ‘copycat’ starts to take over Sarah’s life, imitating her handwriting, accessing her Amazon account and texting her friends. With increasing anxiety and mounting disbelief, Sarah’s grip on reality gradually starts to unravel, leaving her to question not only her family and friends but also her own sanity. Strange, sinister and deeply disturbing, COPYCAT is psychological thriller for the digital age. If you own any kind of social media account, the synopsis alone is enough to send a shiver down your spine. In today’s modern world in which social media has become a fundamental part of many people’s lives, it is easy to forget how vulnerable we really are which makes Lake’s premise all the more chilling. COPYCAT has all the elements of a great psychological thriller – an intriguing synopsis, relatable characters and plenty of twists and turns. The complex tale is well written with short, snappy chapters heightening the tension and suspense. The fast paced plot also sees sections of the narrative written from the point of view of Sarah, interspersed with sections written from the viewpoint of the copycat, which adds further to the suspense and intrigue. In terms of characterisation, the main protagonist, Sarah, is likeable, real and plausible. Her descent into helplessness is vividly evoked and her relationship with her British husband Ben is immaculately portrayed. Even Sarah’s nemesis is truly unsettling as her malevolent and evil intentions become more and more sinister. The only real disappointment is the abrupt ending, which feels rather rushed and unfinished. The reader is so caught up in the mystery that when the plot twist finally does reveals itself, it feels almost hurried and far-fetched in parts. That said, COPYCAT is certainly an enjoyable read with enough twists and turns to keep you guessing until the very end. If you share any parts of your life online, this isn’t a tale which is likely to be forgotten in a hurry. COPYCAT by Alex Lake is released on 7 September 2017 and is available on Amazon * and Harper Collins.